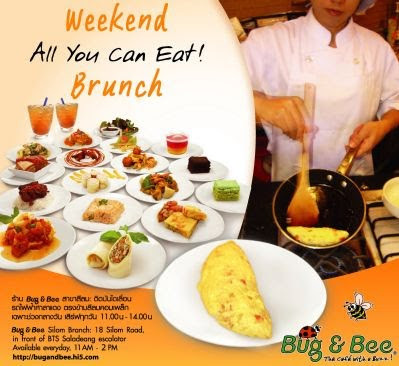 Bug & Bee - a cafe restaurant in Bangkok, known for its creative fusion food - is extending its weekday lunch buffet at Silom to weekends (Saturdays & Sundays) too. The brunch buffet, themed "All Fusion, All You Can Eat" includes unlimited freshly made-to-order dishes, iced fruit teas and desserts, from 11am-2pm everyday, and is priced at 229 baht (50% discount for kids under 12) with a time limit of 90 minutes. Bug n Bee has a pleasant easy-going and relaxed atmosphere, with Wi-Fi internet. Its extensive fusion menu includes signature dishes like Spinach Crepe Lasagne in Italian Tomato Sauce, Cioppino Crepe Noodles with Calamari, John Dory Fish in Choo Chee Curry with Crepe Noodles, Crepe Pad Thai, etc, with new items added throughout the year. Bug and Bee's Silom branch is located right at the Saladaeng BTS escalator; and its other branch at MBK (3rd Floor near BTS Walkway) also has the buffet promotion daily.